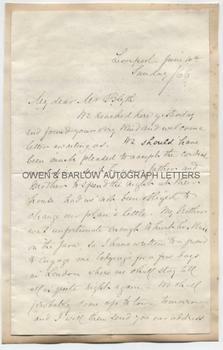 ELIZABETH BLACKWELL Autograph Letter Signed. Elizabeth Blackwell was the first woman to receive a medical degree in America and the first to be entered on the British Medical Register. The first formally qualified and recognised female physician in either country. ALS. 3pp. Liverpool. Sunday, June 10th 1866. To [Edmund] Blyth. "We reached here yesterday and found your very kind and welcome letter awaiting us. We should have been much pleased to accept the cordial invitation sent by your father and mother to spend the night at their house had we not been obliged to change our plan a little. My brother was unfortunate enough to hurt his knee on the Java, so I have written to a friend to engage me lodgings for a few days in London where we shall stay till all is quite right again. We shall probably come up to town tomorrow, and I will then send you our address. Please give my very kind regards to Mr and Mrs Blyth, it will give me very great though sad pleasure, to make their personal acquaintance. And now, my dear Mr Blyth let me offer you my very warmest good wishes for the full realization of all the happiness in prospect for you. I remember perfectly seeing Mrs Crawford on board - but I was very ill during the whole voyage, and I only remember the dim vision of a graceful woman who must have been very pretty, and wondering how anyone could seem so well! She spoke, too, of a marriage in her family when conversing with a friend, but I think she said her only daughter. My brother George writes with me in kind regards, and looks forward with much pleasure to making your acquaintance." Large 8vo. Approx 5.75 x 9.25 inches. 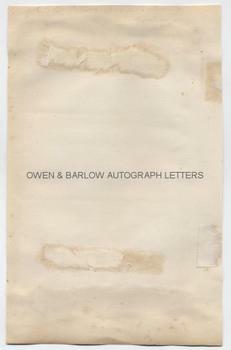 Laid down on part of an old album leaf by the head and tail of the blank verso of the last leaf. All else very good. Elizabeth Blackwell had graduated as a medical doctor, in the face of considerable opposition and prejudice, in 1849 and, with her sister, Emily, established a small dispensary in Tomkins Square, New York. This was expanded in 1857 to become the New York Infirmary for Indigant Women and Children. In the 1860s Elizabeth Blackwell and her family travelled backwards and forwards between America and England, where she attempted to raise funds and also establish a parallel infirmary in the UK. It was during this time that she met and became a mentor to the young Elizabeth Garrett Anderson. The parallel project in the UK fell through and Elizabeth Blackwell returned to America where, by 1866, her New York infirmary was treating 7,000 patients a year. She returned to England in 1869 and established the London School of Medicine for Women in 1874. She campaigned vigorously for womens' rights and became close friends with Florence Nightingale and other women active in social reform and the women's suffrage movement. She pioneered the cause of women in medicine and other fields. 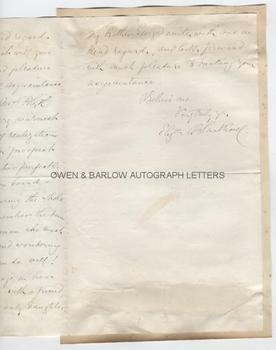 Autograph letters of Elizabeth Blackwell are rarely offered for sale, the majority being held by public and private institutions. Provenance: From a 19th century album compiled by the Blyth family. Edmund Kell Blyth was a London Solicitor and the Blackwell family papers held in the Harvard University Library contain letters between Blyth and Elizabeth Blackwell, written between 1875 and 1889, in which he advised her on financial investments. 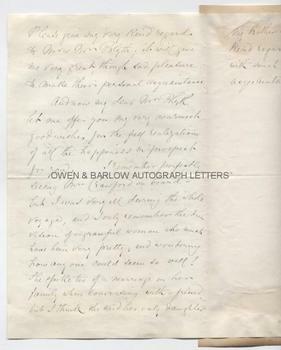 It appears from this letter that Elizabeth Blackwell had met Blyth (or at least his future wife's mother) whilst sailing on the ship 'Java' between New York and Liverpool. It appears that Mrs. Blyth was associated with the Society for Promoting the Employment of Women. The Blyth family also seem to have had a connection with the engineer, Benjamin Blyth and the thrice Australian premier, Arthur Blyth.